Sydney Masciarelli breaks the tape at the Foot Locker Northeast Regional Championship at Van Cortlandt Park in 17:12.60. 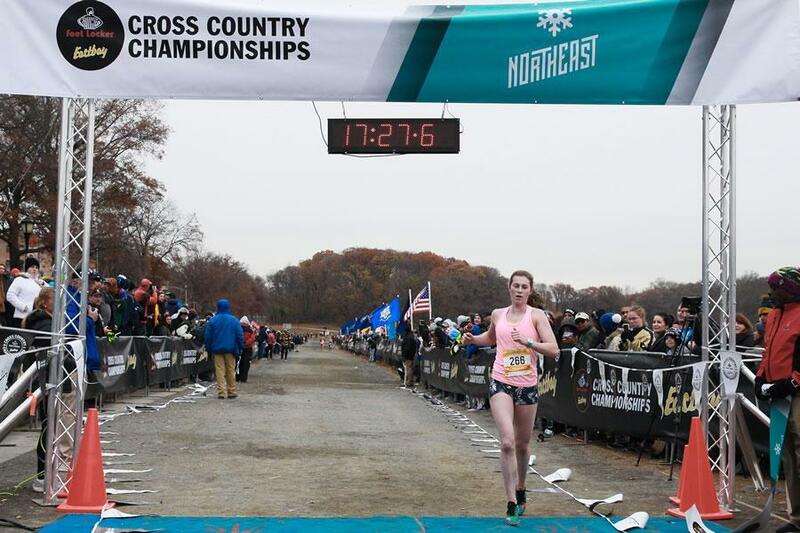 Three local cross-country runners posted top-three finishes at the Foot Locker Northeast Regional Championship on Saturday morning at Van Cortlandt Park in New York. Marianapolis Prep sophomore and Northbridge resident Sydney Masciarelli won the girls’ race in 17:12.60, while Natick senior Grace Connolly finished third with a time of 17:27.50. Brookline senior Lucas Aramburu took second in the boys’ race with a time of 15:37.10. Two other Massachusetts runners also posted top-10 finishes as all five qualified for the Foot Locker National Championship on Dec. 8. The 15-year-old Masciarelli pulled away from Starliper (17:17.50) down the stretch to win the girls’ race. She claimed the top time in her first season running cross-country after playing soccer as a freshman. Connolly had a comfortable cushion of almost 22 seconds between her and fourth-place finisher Abby Loveys of Randolph, N.J., but was outkicked by Masciarelli and Starliper down the stretch. The three-time state champion still bested her fourth-place finish in the 2016 regionals after not finishing last year’s race because of injury. Natick senior Grace Connolly finishes third at the Foot Locker Northeast Regional Championship at Van Cortlandt Park. Aramburu stayed with the leaders throughout the boys’ race, just edging Connor Nisbet of Wilmington, Del. (15:37.70) and Liam Murphy of Allentown, N.J. (15:38.20) for second place. His time of 15:37.10 was seven seconds behind winner Jack Stanley of Mendham, N.J. (15:30.20), and also bested his third-place finish in the same event last year by seven-tenths of a second. Northfield Mount Hermon’s Richard Sturtevant also qualified for Nationals in the boys’ event, placing 10th with a time of 15:41.30. Littleton’s Sarah Roffman qualified in the girls’ race with a ninth-place finish of 18:12.10. All five runners will head to Balboa Park in San Diego to race in Nationals on Dec. 8. Connolly finished ninth in the event in 2016, while Aramburu placed 38th last year. Masciarelli, Sturtevant, and Roffman all qualified for the first time. 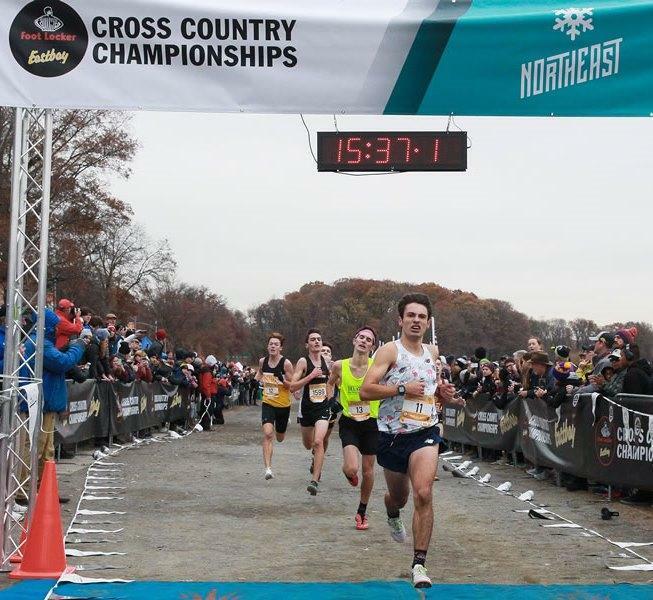 Brookline senior Lucas Aramburu finishes second overall, just ahead of a pack at the Foot Locker Northeast Regional Championship at Van Cortlandt Park.